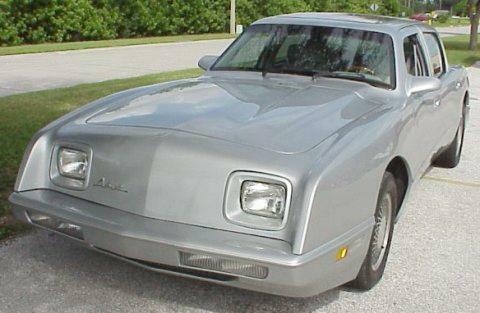 This 1990 Avanti Sedan was sold by Bob's Classics in Largo, Florida. Bob's Classics was established in 1991 and is owned and operated by Bob and Marcelle Simpson. They specialize in unusual cars such as Avantis and Excaliburs. Bob's Classics has sold two 1990 Avanti Sedans as well as a number of Avanti Coupes and Convertibles. Rion MacConnell of Centerville, Ohio sent in pictures of the family 1990 Avanti Sedan and 1989 Avanti Convertible. Technically the later Avantis are not Studebakers, but they are direct developments of the original Studebaker Avanti that was introduced in 1962. When Studebaker shifted automobile production to Canada in December 1963, the rights to the Avanti along with the production tooling were purchased by Leo Newman and Nate Altman and Avanti Motors was born. Although ownership of the company changed hands several times, Avanti Motors managed to stay in business until 1991, and even produced convertible and sedan versions of the stylish Avanti. Other than the addition of modern body colored bumpers, Avanti styling did not change much over the years. This is a tribute to the excellence of the original Raymond Loewy design. Only 90 Avanti Sedans were produced before production ended. 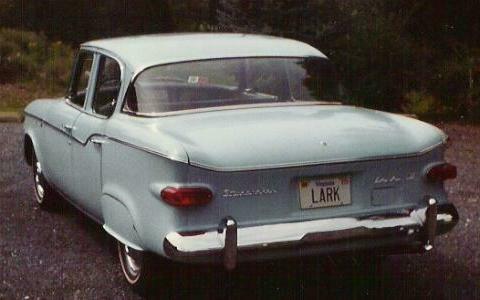 I bought this 1960 Studebaker Lark Regal Sedan from Mason Motors in Timberville, Virginia. The car had been in storage for a number of years and it simply appeared one day on their used car lot. Mason Motors had been a Studebaker dealer and was still servicing Studes at that time. This was a nicely equipped Lark VI with overdrive and Studebaker's "hill holder" clutch mechanism that kept it from rolling back on hills. The fender skits are Foxcraft and were expertly painted to match the original light blue. I enjoyed this car for ten years before selling it a few yeras ago when I acquired my second 1957 Silver Hawk. These pictures were taken during my August 1994 visit to the Studebaker National Museum in South Bend. 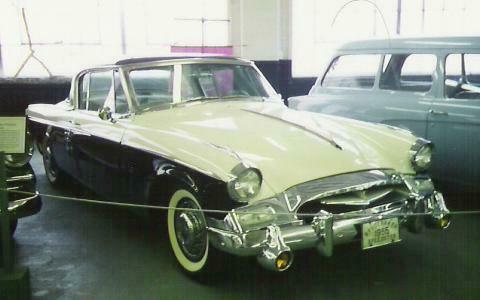 The 1955 Studebaker President Speedster was the predecessor to the famous Hawk series. Speedsters were powered by a 259 cubic inch V8 rated at 185 horsepower. Front fog lights were standard equipment and the interior featured leather upolstery and a nice aluminum faced dash with a full set of round gauges. The nice bolt on wire wheel covers as seen in the picture above were carried over to the 1956 Golden Hawk. Only 2,215 Speedsters were built but it seems that a relatively high percentage have survived given the special nature of this model. 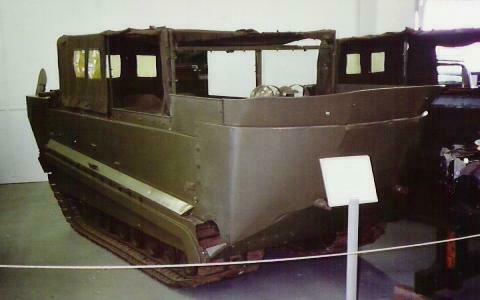 Studebaker developed the M29 "Weasel" tracked cargo carrier during World War II. The story is that the Weasel went from design concept to working prototype in less than 60 days. Although intended for use in the snow, Weasels served in Europe and the Pacific in various roles. The Weasel weighed 6,000 pounds and was powered by the Champion flathead six. Top speed was 36 miles per hour and a 35 gallon gas tank gave a range of 170 miles. About 15,000 were built, and a number were used as artic exploration vehicles after the war. The Pagemaster can be contacted here.